where numerous employees have to travel between back and forth quite frequently. Formerly, a department-wise car supply had been implemented there - with the obligation to return the vehicle to the site where it was picked up. With such a least administration effort, the number of required cars exceeded a reasonable limit after all. For most of the time, they had been waiting for the way back to their origin. In order to partly compensate for this, bus services were necessary for certain kinds of traffic. Thus, Daimler's R&D staff started to think about the reverse fashion: less cars through a smarter administration. The vehicles should be used most extensively, i. e. returned to the pool immediately after every one-way trip. For the administration, Daimler decided to represent every single vehicle by one and only one smart chipcard. Every card is coded individually and serves both as an accompanying car ID tag and as a car key. 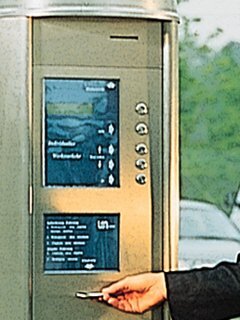 Daimler implemented a card dispenser at each of 4 car pools where the cars are parked in a lot nearby. So, the driver can fetch a card from the machine, unlock the car with it and drive away. At the destination, (s)he re-locks the car with the card and returns the card to the other dispenser that is installed there. Since the dispensers can both read the driver's ID and read/write the cards and are connected online to the vehicle management center, any kind of necessary data exchange can be performed in real time among the spots, e.g. the driver's access rights, vehicle availability, usage statistics etc. Because of the application as a car key in an outdoor environment, it was compulsory to choose a card type that works reliably under water. Rather than selecting a mere transponder, the customer wanted to have considerable room for data collection in a later enhancement. 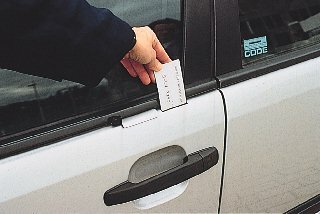 The unevitable card coupler should complement the existing door lock within the car's door in a water-proof fashion too. An additional benefit is the C2®­CARD's intrinsic immunity against car thefts by ‘mystery device’. After all, ADE's contactless smart C2®­CARD was taken. The system performance was adapted to and proved for reliability under automotive climate conditions. The considerably high acceptance by the clients resulted in over 500 trips per month (by the begin of 1998) with the new service. In addition, the cost of the upgraded administration apparatus is almost negligible. As another effect, the handling is better automated than before. You may establish immediate contact to the supplier of the card system, MOSESelectronic®. See also "Catch Your Car at the Car Stop" in page 60...61 of the Daimler-Benz HighTechReport 4/1994.